The online gambling industry is massive, with sites that focus on sports betting or casinos, while others offer a one-stop shop offering everything the gambler could ever want. Before you join and make a deposit with an online bookmaker, here is what you need out of your online sportsbook. I am going to start with the elephant in the room, and that is payouts. Overall, most online sports betting sites are pretty similar. Just like the NFL, it is a copycat industry, and if one sees another leading the pack, there is a good chance they will make some changes to be more like the book that is succeeding. So in my opinion, quick payouts and ease of payment are the most important things to me. If you have ever had action with a sportsbook that made it difficult to request a payout, took a long time to receive, or even worse, never received your payout, you know how frustrating it can be. My sportsbook has the quickest payout turnaround in the industry, and has a massive betting menu like all the big sportsbooks. Not only does my book pay quickly, but they have plenty options to both deposit and withdrawal funds. P2P transfer companies like Money Gram and Western Union are quick and safe, but cryptocurrency options are becoming the norm. With Twitter, FaceBook, forums and other social media outlets, it is impossible to hide shortcomings, making it easier to avoid a sportsbook with a bad reputation. Of course having a good reputation goes hand and hand with payouts, but you have to make sure your book takes pride in improving their technology regularly and avoiding downtime. I once used a sportsbook that had gaming software that could not keep up with the growth of the company. Many times I was unable to place a bet because their site was down, and when it was up, it was so slow I felt like I was using dial-up. It just takes a little homework to try and dig up some dirt on any online sportsbook, and it is more than worth taking the time to do so. One word of caution though, when using sportsbook review sites, remember that a lot of them are funded by the very sportsbooks they are reviewing, so some can be biased. Now that we have the boring stuff out of the way, let’s get into some fun stuff. Once you have taken the time to find a trustworthy sportsbook, the next thing you want to do is check out their betting options. Today, the options available to sports bettors are nothing short of incredible. On top of the traditional wagers like point spreads, totals, and moneylines, you have teasers, pleasures and futures on sports from all across the world. The prop odds that you will find are mind-blowing, giving you the ability to bet on specific parts of any event. For example, you will find player props for quarterbacks to kickers in NFL games, letting you get closer to the game then ever before. Speaking of getting closer to the game, have you tried live betting? If you haven’t, you need to give it a shot. In a live betting interface there will be real time odds for game lines, half lines, multiple game totals, team totals and exact totals. Those options are just the tip of the iceberg, with betting options a plenty. The options do not end there either, because like I mentioned earlier, some online sports gambling sites offer casinos and racebooks. The site I use has a live dealer casino, a virtual casino and a racebook that features odds from 70 or more tracks, letting me bet simple win, place and show bets and even exotics. I could not ask for more. Quick payouts, site reputation and betting options would top my list if I were to look for a new online sports book. 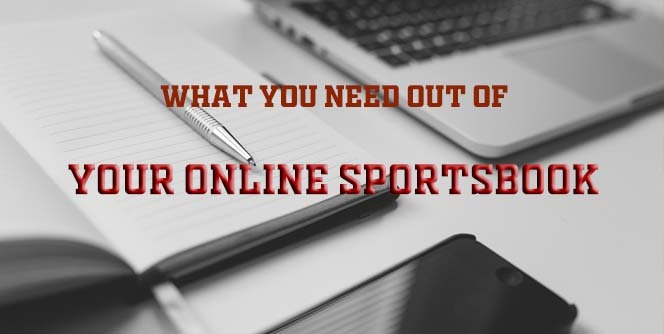 Customer service, competitive lines and spreads and having a great mobile interface are important as well, but this is a great start in what to look for when knowing what you need out of your online sports book.